Lightened up chicken salad full of fresh and zesty flavors! 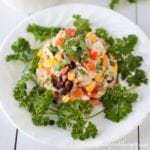 In a large bowl, combine the chicken, beans, corn, cilantro, and pico de gallo. In a small bowl, mix the Greek yogurt, taco seasoning, and lime juice. Add the yogurt mixture to the chicken mixture and toss to coat. Chill in the refrigerator for 30 minutes or more to let the flavors set.